As a consulting company, your job is to help your clients to be more efficient. But if your own team does not appear to be efficient, why would anyone hire you? The invoices you send to your customers are a reflection of your company’s internal efficiencies. Your invoicing process can leave either a positive or negative impression. After all, no one likes paying bills, so let’s eliminate as many pain points as possible. Here are some invoicing tips that will greatly add to your bottom line. When project consultants do not complete their time sheets promptly and accurately, customer billing is delayed. A big wave of “catch-up” time entry results in the customer being invoiced for a large amount all at once. This can raise some red flags. Not only is the customer more likely to question the charges, it can erode the trust you have established with them, jeopardizing your relationship and future work. Time entry should be done daily and invoiced on a consistent schedule. If an employee has to go back several weeks, or even a month, to enter time for a project, it will be hard to remember the fine points of the work performed. Likely they’ll settle for a general description. For instance, instead of recording "Onsite meeting to discuss development standards," they may just enter, "Meeting." When the customer sees the invoice line item, they may ask, "What meeting was this?" Then the project manager has to talk to the employee, and the employee has to refer back to their Outlook calendar or their sent emails and try to come up with the answer. This is a waste of time not only for the project team, but also for the customer, and moreover, it looks bad. The project manager never wants to be “the timesheet police,” but as project manager, they are tasked with keeping projects on time and on budget while making sure resources are properly utilized. And most importantly – no surprises! If time isn't entered, there is no way to measure the services performed against the project budget. Companies that run over budget due to inefficiencies in their project cost accounting processes are not likely to be hired back for future work. Project Managers need to have full visibility into project status, budget, and milestones, so they are able to keep the project on track and keep the customer informed. Many consulting firms typically have minimum billing increments. This means that if your customer calls you for a status update that takes 55-minutes, you would bill them for 1-hour, since you bill in 1-hour time increments. If billing always shows a consistent eight hours a day, five days a week, this can raise suspicion. A client could start to question if time was being billed while the consultant might have been eating lunch, checking email, or taking unrelated phone calls from other customers. Clients will notice and appreciate billing that shows it has been reviewed for accuracy and shows only the actual time worked with supporting details. Employees need to account for their time, prove the value of that time, and then bill time appropriately to the customer. That's the nature of most services companies. You never want a client to look at an invoice and say in the back of their mind, "Wow, why would they have done that? Maybe they don't have their act together. So why am I hiring them to help me get my act together?" A key to making a good impression with your project billing is to make time entry simple for your busy employees. This will make for more accurate and timely invoice creation. The sooner the invoice is in the mail, the sooner you get paid. Crowe Timesheets is an easy-to-use time tracking solution integrated with Microsoft Dynamics 365. Crowe Timesheets will reduce the amount of time it takes employees to enter their working hours and will ensure more accurate and timely timesheet submissions. Managers can review dashboards and reports to confirm that detailed and accurate descriptions are available to the customer. Learn more about Crowe Timesheets for Microsoft Dynamics 365 on Microsoft Appsource. The CRM functionality in Microsoft Dynamics 365 gives you the tools you need to improve the efficiency of your project team and leave a great impression with your customers. 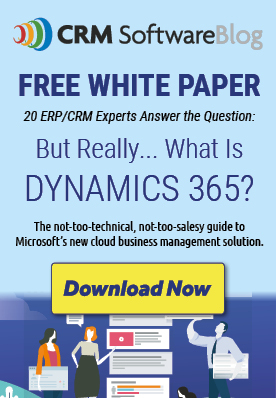 If you are interested in evaluating Microsoft Dynamics 365, contact us today.